… up here on Cloud Nine. There is a measurement for the amount of cloud cover in the sky. That is the ‘okta‘. Not surprisingly there are eight of them. Zero is when the sky is completely clear of cloud and an okta value of eight is when the sky is completely covered. so four is when the sky is half covered. The use of an octal numbering system apparently makes it easier to measure by using a mirror divided into a four by four grid. Nowadays measuring cloud cover is done from satellites and is a lot more sophisticated. But the system falls down when you can’t see the sky, when it is obscured by fog or falling snow. It is then said to have an okta value of nine. Cloud Nine has also come to mean being in a state of drug-induced euphoria. When the 1960s Motown group The Temptations sang about “doing fine on Cloud Nine” they categorically denied it was about drugs but about escaping from the problems of extreme poverty and deprivation. You can tell what musically influenced my teenage years. Descending Little Roseberry in cloud nine. 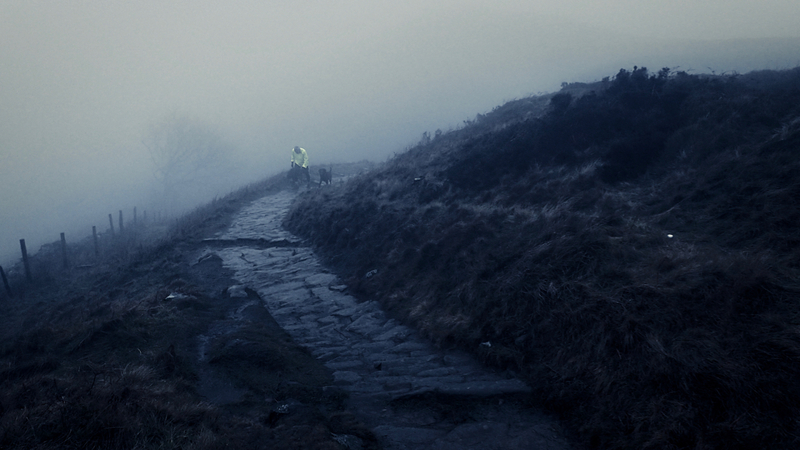 A claggy, miserable morning, but surprisingly this was the third group of runners I came across.